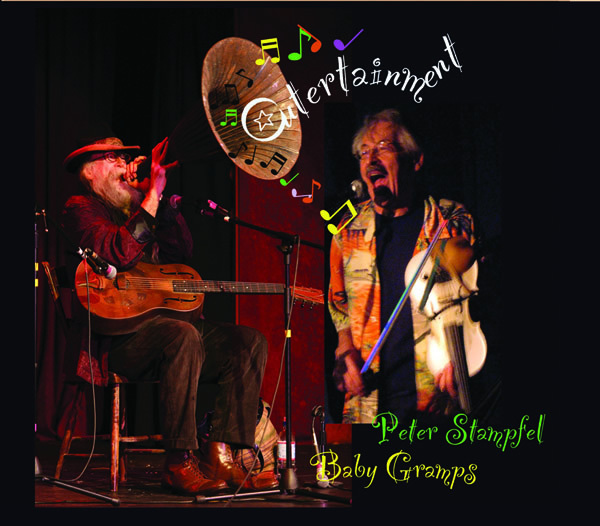 Peter Stampfel and Baby Gramps. Outertainment. Red Newt Records. Way back in the 1960’s there were none so weird and way out as the Holy Modal Rounders. Initially an acoustic duo comprised of Peter Stampfel on banjo and fiddle and Steve Weber, guitar, they jerked songs featured on the Harry smith Anthology of American folk music into the psychedelic sixties. In a decade long musical odyssey they ganged up with the inflammatory Fugs for a few albums and featured on the Easy Rider soundtrack. With members coming and going (including both founders) at various times their journey culminated in a zenith with Have Moicy!, a collaboration with Michael Hurley and Jeffrey Frederick that is generally considered one of the lost treasures of the 1970’s. A Stampfel/Weber reunion in 1999 produced a fine album in Too Much Fun that revisited some of the glories of their first two albums. Since then Weber has for the most part retreated from the music biz (although he has released some vintage live recordings recently). Stampfel however ploughs on and over the years has released albums with The Bottlenecks, The Du-Tels (with ex Beefheart guitarist, Gary Lucas) and as a solo act. No matter the format however he retains a goofy childlike sense of wonder and above all an enduring love for and knowledge of American folk music. Here Stampfel teams up with a character who seems to be as idiosyncratic and, well, as goofy, as him. Baby Gramps is a Seattle institution having busked and played there since perhaps the sixties. A well kept secret until he appeared on Rogues’ Gallery, a collection of pirate themed sea chanteys a few years back, Gramps has a voice that has been described as Popeye like and he shares Stampfel’s irreverent and iconoclastic approach to the classics of old time American music. Well, no map perhaps but its topography is well described here. While the likes of Seasick Steve have popularised traditional American folk blues recently this album portrays two artists who are steeped in the idiom but who present it through an unpolished, intensely personal viewpoint. It might not be pretty but it is pretty amazing. Special mention should be given to the unobtrusive bass playing of Dave Reisch who has served with Gramps, Stampfel and Michael Hurley over many years and who performs the same duties here and Curtis “King chamberlain who adds little touches of jaw harp, penny whistle and jug. Norman Ira Savitt is New York based guitarist who has long had an association with Peter Stampfel and their small circle of (mutual) friends. Armed with a deep knowledge of old time American music and familiar to those who frequent the websites and message boards of folk like the late Tuli Kupferberg (of The Fugs) he has released his first ever album, a meditative and peaceful collection of instrumentals based on his finger picking skills. Whether solo or accompanied by harmonica, cello, violin or penny whistle the result is wistful, at times elegiac with pieces dedicated to Ken Kesey and Chris Whitley (an old friend of Savitt’s). It’s always tempting to mention John Fahey when a guitarist releases an album like this and although Savitt’s playing lacks Fahey’s baroque eclecticism and occasional dissonance the feeling generated when playing the album is similar to that of Fahey’s more straightforward pieces, Alex at Six in particular fits this bill. David Amram’s penny whistle on this tune evokes primitive cultures and the quills used by Canned Heat on Going Up The Country. Elsewhere Savitt, (with the aid of Eugene Friesen on cello) conjures up wintry English folksong on Prayer for Peace and Celtic mist on Alone. Howard Levy (from Bela Fleck’s band and who produced) adds some haunting harmonica to several tunes while violinist Susan Mitchell colours the tribute to the Reverend Gary Davis, One for the Rev where Savitt uses some Davis licks to great effect. Savitt’s liner notes indicate his affinity to nature and the great outdoors and in an untutored, Carradine like zen mood, one could imagine that listening to this album is akin to watching a pebble fall into a still pond and digging the ripples long after they’ve gone. Finally while we’re on things Rounder related a mention for Charlie Messing. Sprawling Epic. Charlie Messing was once a Rounder, late in the days but a member of that fabled troupe so a sneak preview of his forthcoming album was serendipitous. Apart from his part in the Rounders story Messing has played with Link Wray and Robert Gordon and backed up Loudon Wainwright. In addition he has a wealth of tales to tell of the New York scene from the boho sixties to the punk seventies and beyond which used to be available on his now defunct webpage. Indeed he’s like a musical Zelig, being there at fortuitous moments and this is reflected in his music. Sprawling Epic looks to be a fairly eclectic pick of his own songs and a few choice covers (including Tom Waits, Michael Hurley, Dean Martin and Blind Willie McTell) all sung in his peculiar and endearing hangdog way. Low key and laid back it has a simple charm. Check back for news of the release date. This entry was posted in Reviews and tagged Baby Gramps, Charlie Messing, Holy Modal Rounders, michael Hurley, Norman Savitt, Peter Stampfel, Seasick Steve. Bookmark the permalink. Yup, I thought it meant a kind of mournful demeanour (look up Clement Freud for example). deadpan is probably better.